Some 400,000 of them hailed from the British Indian Army, whose 1.5 million troops comprised the largest volunteer force in history. Now, a century after Muslim soldiers from South Asia, North Africa and elsewhere went to war for their colonial masters, a U.K.-based campaign is working to shed light on their oft-overlooked sacrifices. The idea is to give overdue appreciation for the Muslim contribution to the war effort and use the stories of Muslim soldiers to counter Islamophobic and anti-immigrant narratives in Europe and North America. Look closely at figures of the Virgin Mary and Joseph, and you will notice something odd. Their halos feature Arabic script. That might seem sacrilege in a Christian religious painting. Yet as a new exhibition in Florence, at the Uffizi and the Museo Nazionale del Bargello, sets out to show, such cultural and religious cross-dressing was common at the time. Entitled “Islamic Art and Florence from the Medici to the 20th Century”, the show explores “the knowledge, exchange, dialogue and mutual influence that existed between the arts of east and west”. 1 Secularization is widespread in Western Europe, but most people in the region still identify as Christian.Rising shares of adults in Western Europe describe themselves as religiously unaffiliated, and about half or more in several countries say they are neither religious nor spiritual. Still, when asked, “What is your present religion, if any?” and given a list of options, most people identify as Christian, including 71% in Germany and 64% in France. 2 Even though most people identify as Christian in the region, few regularly attend church. In every country except Italy, non-practicing Christians (that is, those who attend church no more than a few times a year) outnumber church-attending Christians (those who attend church weekly or monthly). In the UK, for example, there are three times as many non-practicing Christians (55%) as practicing Christians (18%). Non-practicing Christians also outnumber religiously unaffiliated adults in most countries surveyed. 4 Majorities in most countries across the region say they would be willing to accept Muslims in their families and in their neighborhoods. Still, undercurrents of discomfort with multiculturalism are evident in Western European societies. 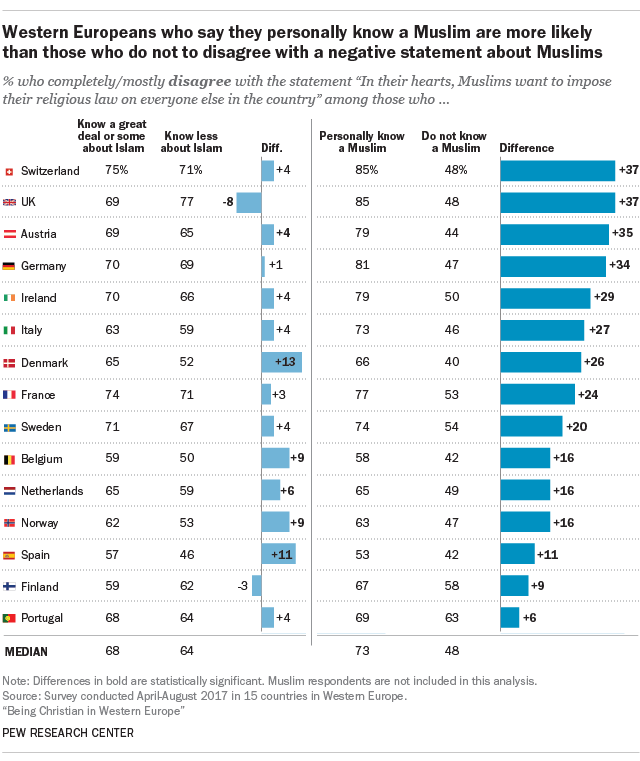 People hold mixed views on whether Islam is compatible with their national values and culture, and most favor at least some restrictions on the religious clothing worn by Muslim women. In addition, roughly half or more in most countries in the region say it is important to have been born and have ancestry in a country to truly share its national identity. For example, roughly half of Finnish adults say it is important to be born in Finland (51%) and to have Finnish family background (51%) to be truly Finnish. There is a widespread belief, especially among right-wing politicians in Europe, that Islam is incompatible with Western civilization and has contributed nothing to it. The Dutch politician Geert Wilders captured this perception when he described Islam as a ‘culture of backwardness, of retardedness, of barbarism.’ It is worth our while therefore to investigate whether this assertion is, in fact, correct. If it is not, the basis of the Islamophobia of Islam’s critics like Wilders collapses like a house of cards. They will then have to use some other arguments against Islam or their racial prejudices will stand exposed; they will be naked without benefit of a niqab to cover their modesty. The impact of Muslims on European culture is deep and extensive. I will use material from my book Journey into Europe to illustrate the assertion over the next few weeks. Perhaps Islam’s greatest contribution was to introduce the idea of a unified understanding of our spiritual universe, which was reflected in the art, architecture, literature, and society in Andalusia based in religious pluralism and acceptance, one that valued learning and the ilm ethos. It is this society that produced an Ibn Firnas, who attempted flight, and religious philosophers like Maimonides and Averroes, who sought to balance reason and faith. Andalusian society, in turn, sowed the seeds for what would become the European Renaissance, which would lead to the Enlightenment and go on to shape our modern world.